The 1950s...The good old days. This may be true for some members of 1950's society. But for many people, the 1950s represented a decade of social tension. 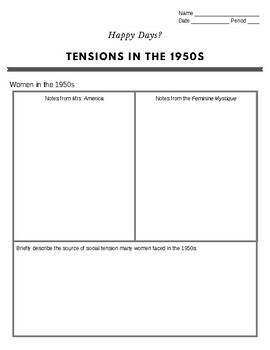 This assignment helps develop students' understanding of social tensions that existed during the 1950s. 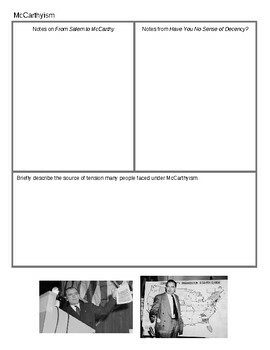 Students will focus particularly on the experiences of women, society under McCarthyism, and the emerging Civil Rights Movement. 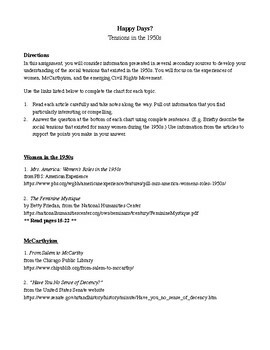 For each topic, students are asked to read two online articles and take notes as they read. They will then write a few sentences about the existing social tension, using information from their readings to justify their answer. This purchase includes a ready-to-go student packet. 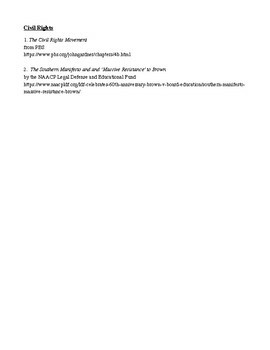 It includes a directions sheet with all the links needed and the charts for each topic. * Suggestion 1: Email the directions page to the students so they can copy the links into their browsers. * Suggestion 2: After students complete the assignment, have them get into groups to discuss their answers and report their findings out to the whole class. Thank you for your purchase! Enjoy!